Enhanced anaerobic bioremediation is the practice of adding hydrogen to soil and groundwater to increase the number and vitality of indigenous microorganisms performing anaerobic bioremediation on any anaerobically degradable compound. Anaerobic bioremediation of chlorinated solvents, a process also known as reductive dechlorination, is the biologically mediated process by which chlorinated hydrocarbons are degraded under anoxic or anaerobic conditions. During this naturally occurring process, anaerobic microbes substitute hydrogen for chlorine on chlorinated contaminant molecules, thus dechlorinating the compound. Complete reductive dechlorination results in the chlorinated compounds being transformed to non-toxic, dissolved gases such as ethene and ethane. Reductive dechlorination typically proceeds at very slow, unstable rates. The use of an electron donor such as 3-D Microemulsion or Hydrogen Release Compound (HRC®) can increase the rates of reductive dechlorination up to several orders of magnitude. 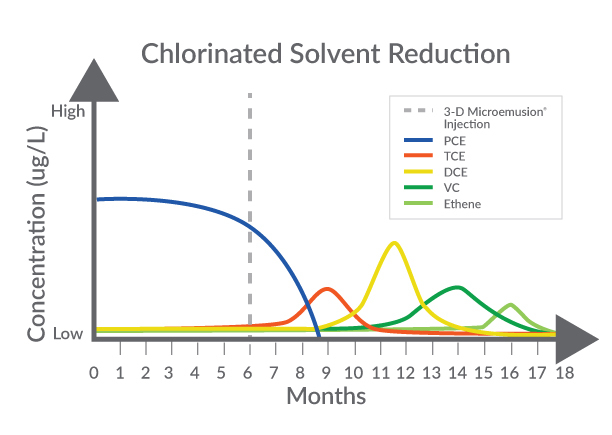 Under the influence of staged-release hydrogen through 3-D Microemulsion or HRC, the reductive dechlorination process can be sustained for periods of up to 2-5 years depending on subsurface conditions. Enhanced anaerobic bioremediation is most commonly used for the treatment of chlorinated groundwater contaminants such as industrial degreasing agents like tetrachloroethylene, trichloroethylene, trichloroethane, carbon tetrachloride, certain pesticides/herbicides, nitro-aromatic explosives, hexavalent chromium, and chlorinated fluorocarbons. REGENESIS welcomes the opportunity to provide you and your team with the tools you need to successfully plan and execute your next enhanced anaerobic bioremediation project. Is enhanced anaerobic biodegradation the right solution for your contamination concern? Find out here. Watch the video of in situ remediation of TCE and DCE in silt and clay sediments at an active facility in Sweden. Have a look at our track record with enhanced anaerobic bioremediation with Case Studies. What is Enhanced Anaerobic Bioremediation? Enhanced anaerobic bioremediation is the practice of adding hydrogen to soil and groundwater to increase the number and vitality of indigenous microorganisms performing anaerobic bioremediation. In this process, anaerobic microbes substitute hydrogen for chlorine on chlorinated contaminant molecules, dechlorinating the compound. Enhanced anaerobic bioremediation is most commonly used for the treatment of chlorinated groundwater contaminants such as industrial degreasing agents such as chlorinated solvents. Is enhanced anaerobic biodegradation the right solution for my contamination concern? Enhanced anaerobic biodegradation is an effective solution for contaminants such as industrial degreasing agents like tetrachloroethylene, trichloroethylene, trichloroethane, carbon tetrachloride, certain pesticides/herbicides, nitro-aromatic explosives, hexavalent chromium, and chlorinated fluorocarbons. Enhanced anaerobic biodegredation treatment approaches can last anywhere between 1 and 5 years and commonly require 1 treatment/injection event. What is the difference between aerobic and anaerobic bioremediation? anaerobic bioremediation the microbes degrade the contaminants in the absence of oxygen.